the baby's room is set up. all the clothes are washed and put away. the strollers and car seats are assembled. we know how to put together the pack-n-play. we went through a childbirth class. we're cpr [infant and adult] certified. we've toured the hospital. i have my birth plan. the hospital bag gets packed this weekend. but the only thing i'm completely stuck on is the diaper bag. i'm incredibly picky about the bags i carry and i just really, really don't want some silly printed diaper bag [no matter how "convenient" it may be] and normal ones are hard to find. 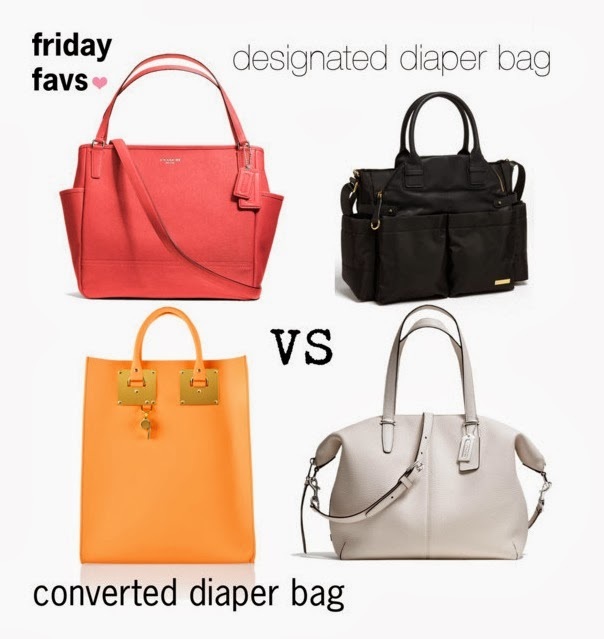 i like the coach baby bag tote and the skip hop chelsea diaper bag, but that's about it. so i need your help, mamas out there. should i get a designated diaper bag or convert a [much cuter] non-diaper bag [like this sophie hulme tote or coach bleeker cooper satchel] into a diaper bag using inserts? Get a diaper bag! You'll have more baby stuff to haul around than you imagined and you'll be wishing you went with a stylish, real diaper bag. I have been really happy with my Kate Spade diaper bag - trendy, stylish and still a diaper bag. :) Whitney PS This recent article from Marion reminded me of your dilemma http://www.marionberrystyle.blogspot.com/2014/01/diaper-bag-confessions.html - Hope this helps you!! I should write a whole blog on this. Washable or wipeable fabric is a must. Furthermore, the lighter the better. You are going to be amazed at how much stuff is in your bag. In addition, something always spills or gums up the diaper bag. If it were me, I'd buy a starter bag that is basic and cute like 7a.m. infant barcelona bag and then you can figure out what features you'll really need. In the meantime, buy yourself a cute designer wallet to throw in there or a clutch for date night! thank you!! i knew you'd have some words of wisdom. i just went with the practical skip hop chelsea - we'll see how i like it! Oh my goodness that pink bag is SO cute! Love it - this is agreat Friday Fancy!